In fact, it happens in two obscure footnotes in Chapters 5 and 9 in volume 1 of Capital. (1) “From the foregoing investigation, the reader will sec that this statement only means that the formation of capital must be possible even though the price and value of a commodity be the same; for its formation cannot be attributed to any deviation of the one from the other. If prices actually differ from values, we must, first of all, reduce the former to the latter, in other words treat the difference as accidental in order that the phenomena may be observed in their purity, and our observations not interfered with by disturbing circumstances that have nothing to do with the process in question. We know, moreover, that this reduction is no mere scientific process. The continual oscillation in prices, their rising and falling, compensate each other, and reduce themselves to an average price, which is their hidden regulator. It forms the guiding star of the merchant or the manufacturer in every undertaking that requires time. He knows that when a long period of time is taken, commodities are sold neither over nor under, but at their average price. If therefore he thought about the matter at all, he would formulate the problem of the formation of capital as follows: How can we account for the origin of capital on the supposition that prices are regulated by the average price, i.e., ultimately by the value of the commodities? I say ‘ultimately,’ because average prices do not directly coincide with the values of commodities, as Adam Smith, Ricardo, and others believe.” (Marx 1906: 184–185, n. 1). So here Marx is referring to the idea, taken from the Classical economists, that real world prices fluctuate around prices of production (or Classical equilibrium prices based on cost of production plus a uniform rate of profit), and that he admits that these prices of production do not equal labour values. This appears to be the first point where Marx raises this issue, and it is astonishing something so important is relegated to a footnote, when it contradicts the theory of value in the first chapters of Capital. However, the context shows that the “calculations” where Marx assumes that value equals price are merely those in Chapter 9, and this can hardly be taken to be a statement where Marx is saying that all examples throughout volume 1 assume value equals price. Nevertheless, as in the first footnote, Marx notes that “average prices” (or prices of production) cannot be taken to be equal to labour values. (1) Marx thinks that the labour value of units of gold or silver have a tendency to determine prices (as discussed here). (2) The idea that it is possible to accurately measure the value of skilled labour by looking at the exchange values of products of skilled labour as against products of unskilled labour (Marx 1906: 51–52) makes no sense unless Marx really believes that commodities tend to exchange at pure labour values. All these are rendered false and absurd if prices only ever equal labour values rarely and by accident. Now it might seem strange that Marx contradicts himself in the footnotes, but it is not that surprising because Marx wrote drafts of volumes 2 and 3 of Capital before volume 1 (see here), and it is likely that, under pressure from Engels to produce a work in defence of communism, Marx’s ideological commitments skewed volume 1 so that it presented capitalism in the worst light possible and with an extreme and dogmatic defence of the labour theory of value, which, in view of his work on the draft of volume 3 of Capital, Marx knew to have severe problems, such as the transformation problem. That is very probably why Marx never bothered to publish volumes 2 and 3 of Capital in his lifetime. The suspicion is that he never did so because he was unsatisfied with his attempts to defend the labour theory in volume 3, and only ever hinted at these problems in volume 1, and if he had gone into extensive details the whole theory of value in volume 1 would have been shattered. it is astonishing something so important is relegated to a footnote, when it contradicts the theory of value in the first chapters of Capital. It's only a contradiction if you view price/value equality in concrete exchange as a tenet of the theory and not as a simplifying assumption. Once again, how you read it matters. If we have two, conflicting readings, then the result is two separate theories that must be tested independently. This is not a controversial statement; it's the most basic scientific due diligence we're obligated to perform. (1) He never lets go of this idea, but the point you miss is that whereas volume 1 holds value equal to exchange value to simplify, volume 3 permits exchange value to vary from value -- even for precious metals. It makes perfect sense to hold off on considering this, as it can complicate the picture greatly. Sort of like how in Newtonian physics, you don't start off taking wind resistance into account when trying to calculate the trajectory of a projectile; first you work on the normal, basic principles, and then start working complications into it later. (2) The aggregate equality of price and value also makes this possible. You're not up to it in the text yet, but you'll get there. (3) As I stated elsewhere, "normal" here can either refer to "the common outcome of a concrete exchange" or the "basic operations of the law" as discussed in my Newton example in (1). If we're truly taking this study seriously, we should see how each of these interpretations affect our outcome, as I say above. At the risk of giving away the ending (because, really, spoiler alerts on a document over a century old are just silly) the interpretation I support performs spectacularly. However, if reinventing the wheel is the goal, then I won't complain. (1) "It's only a contradiction if you view price/value equality in concrete exchange as a tenet of the theory and not as a simplifying assumption." And we've seen you have no convincing evidence that Marx ever said in vol. 1 that his idea that individual commodities tend to exchange at pure labour values is just a "simplifying assumption". All the evidence shows that Marx meant what he said, and there is a mountain of evidence that his theory of vol. 1 is indeed this. (2) "The aggregate equality of price and value also makes this possible." (4) as the Anonymous said, you post some absurd table that has no actual empirical evidence in support of your theory. 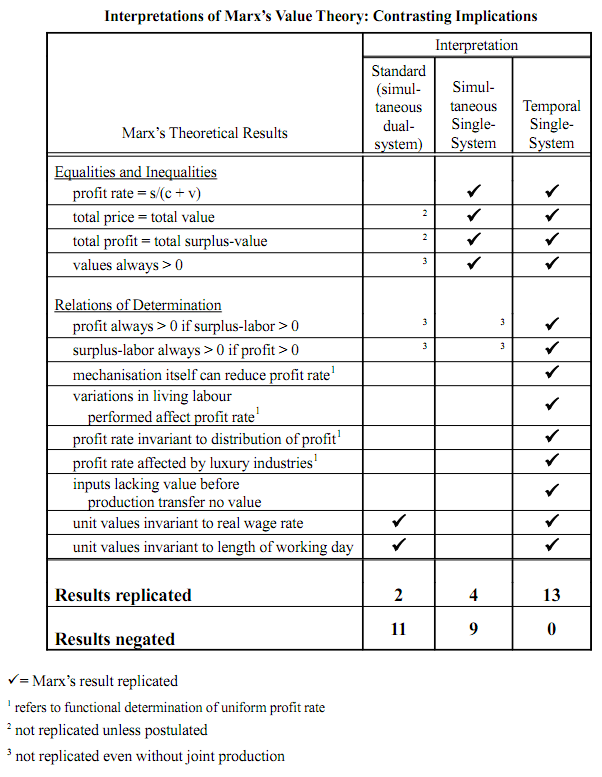 Also, I love how the table says "mechanisation itself can reduce profit rate" -- as if this is some major characteristic of capitalism and empirically "supports" for Marx's theory. Rather, the empirical evidence shows that automation/ mechanisation increases profits. Epic fail. I actually clicked on your link in the hope of finding data that might confirm Marx's theory and found a table with no data whatsoever - just words and tick mark in boxes that some Marxist hack would like the reader to believe is "evidence". If you'd actually worked in experimental science, rather that merely referring to Newtonian physics with faux familiarity, you'd know that evidence in support of a theory means observations from the real world, which in the case of Economics means actual figures from a particular industry or firm. I've provided, by this point, dozens of scholarly documents both clarifying and testing Marx's theories -- books and articles alike. Countless thousands of words have been written on this over the last 2-3 decades. The graphic I linked -- to spur discussion, rather than to merely declare victory, as some around these parts tend to do -- is "Table 2" from A. Kliman's “Value in Process: On the Temporality and Internal Consistency of Marx’s Capital" (2001). For a more elaborate discussion of the topic, his 2007 book is still hard to top as a single-volume treatment. You're new to the discussion, so I'll let the "hack" and "faux" business slide, since I'm sure it may indeed have seemed that way. But in the future, if something is unclear or insufficiently informative, please take a moment to ask before you jump right to smearing. The paper you linked contains no real world data. In Table 3, there is merely a hypothetical example involving "Good A" and "Good B" with hypothetical unit prices and outputs. This is not how theories are tested and confirmed in a scientific discipline. The paper I linked was not an empirical study, nor was it advertised as such. I even said as much in a comment above, though I see now that it was never published. Anyway, anon, the point of that paper, and virtually all of my conversations with LK so far, is this: There is a great deal of dispute on the question of internal consistency in this particular school. Internal consistency is fully situated in the realm of theory, and the attached debates serve to determine which variants of the theory are even suitable for testing, since a theory with internal inconsistencies is excluded a priori from the possibility of being correct. Sorry if there was any confusion on that point. If you're looking for a specifically empirical study, you can't do much better than Kliman's "The Failure of Capitalist Production," which uses US BEA data to illustrate Marx's central theses -- crucially, the secular fall in the average rate of profit -- and explains how these factors can explain the 07 crisis. I can suggest important work by other Marxists as well, such as Roberts, Carchedi, or Cope, but it's probably best to start with the book I mentioned. If values and prices do not equate in concrete exchange, or rarely do, then the capitalist 'laws of motion' Marx outlines in Volume I--the production of surplus value, commodity fetishism, the process of capital accumulation, etc.--don't really follow, because they rely on a deterministic interaction between labor values and prices. These laws of motion would look quite different or would at least need to be explained differently if one adopts at the outset the perspective that value can and does vary from exchange-value. But Marx never goes back and reinterprets, restructures or re-explains the concepts of Volume I from from that perspective. Instead he uses them as the basis for his theoretical arguments in Volume III. The result is not so much dialectical contradiction as it is theoretical incoherence: a set of theoretical concepts based off of another set of theoretical concepts with conflicting assumptions. Could you exegetically contort it back into coherence? Maybe, if you stretch. Would it just be better to overlook what Marx doesn't get quite right and use certain good insights he made anyway as tools to come up with a better theory of capitalism's 'laws of motion'? Absolutely.